This course is intended to introduce R for statistical computing, in a simpler manner to researchers who are in need. 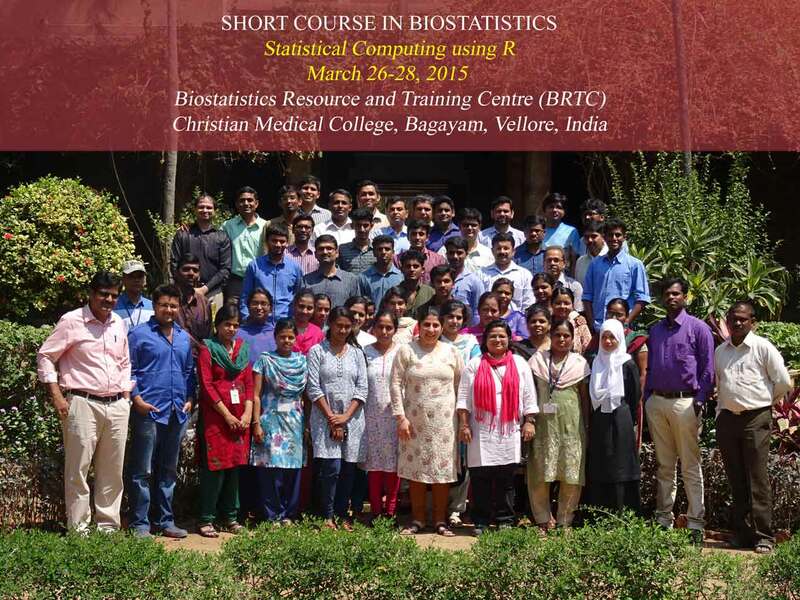 The idea of this training program is to introduce a number of basic concepts and techniques that should allow the participants to get started with practical statistics using R.
This course is also planned to furnish some advanced statistical analyses and techniques with real time datasets so as to improve the participants ability to understand and interpret the findings and produce R graphs. The course is targeted towards researchers of varied profession such as medicine, public health, life science, social science, nursing, epidemiology, biostatistics etc. Why Should Bio-statistician, Epidemiologists and Researchers learn R Software? R software is an open source programming language and environment designed similar to S language developed at Bell Labs by John Chambers and colleagues. R initially written & released as an open source software. The statistical methods on recent developments such as Longitudinal data analyses, Multi Level Modeling (mixed effect models), Times Series analyses, Bootstrapping etc, besides statistical methods are available as broader headings under CRAN Task Views. R software obtained from CRAN servers can be considered as the one-time stop to shop everything to the user needs. Even some of these methods are not available in STATA and SAS. The positive side of R is that as and when researchers develop codes for their research work, they convert this as a package and make this available in CRAN servers. For instance, Bayesian Task View will provide the users with listing of various programs that involves Bayesian analysis with simple description. Thus large number of packages are available in R. This is one of the best software for Graphics. R journal: The users are provided with good user manual along with R software for learning purposes. For further learning the users can utilize open access R journal. R forum: If user gets any kind of difficulty either in using the packages or in writing self-program can write an email to the R forum group or the package maintainer. SAS & SPSS integration with R: Many licensed softwares understand the importance and specialty of R software, releases their recent version with integration of R software. Its open source and free: User no need to pay for the software and can get the access to view the source code of each and every built-in program of the software. It even gives user the flexibility to customize source code. In few years times, all Arts and Science colleges will be teaching R as this is Free. The whole world will be using R software. Let us NOT stay back. Opinion of R software from Expert: Here’s a synopsis of one person’s story. He used SAS and, being a fan of open-source, attempted to learn R. He became frustrated with R and gave up. When he had a simple problem that he couldn’t do in SAS, he quickly solved it with R. Then over about a month he became comfortable with R from consistent study of it. In hindsight he thinks that the initial problem was that he hadn’t changed his way of thinking to match R’s approach, and he wanted to master R immediately. Participants will have to bear their own expenses for travel, boarding and lodging. The Organizers will give Course kit, Lunch and Snacks. However the organizers may arrange basic accommodation with A/C facility in the college campus on request. Only limited accommodation available in the campus and priority will be given to the female participants on first come first served basis. Others, they may have to book the rooms directly to the hotels. The list of hotels are available in the website. Course Fee should be paid in full by March 09, 2015. Introduction and Data manipulation using R : Installation, libraries & packages, online help. Using R :basic arithmetic operations, creating variables, value labeling, functions, vectors, matrices & arrays, factors, data frame, indexing, conditional selection, subset & transform, sorting. Importing data from difference software, Exporting, data entry in R, looping, merging and reshaping. Probability and Distribution : Random sampling, probability calculation, discrete distributions, continuous distributions, build in distributions in R.
Descriptive Statistics : Calculating Mean, standard deviation, displaying Normal curve, generating tables. Parametric tests:- independent t test, paired t test. (independent observations), Wilicoxon signed rank test (paired observations) and calculating the correlation coefficient. Survi val Analysis:- Estimating the survival probabilities, comparison of survival curves, obtaining regression estimates using Cox proportional hazards model, Interpretation, model building and diagnostics. R Graphs:Histogram, Vertical bar chart, Pie Chart, Box plot, Scatter plot, Combining Charts.